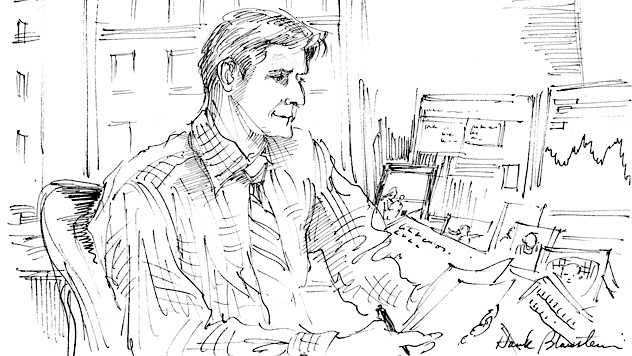 ﻿﻿Co-CIO Francis Gannon offers important context about the small-cap market related to a recent Barron’s piece in which he was quoted. We were very happy to have been quoted in an article that appeared in Barron’s on 1/20/18, penned by Brett Arends and titled, “Unseen Dangers in Small-Cap Stock Rally” (registration required to access article). The piece attempted to get a sense of where small-caps as a whole may be headed next, first by running through the evidence for optimism. With the global economy experiencing synchronized expansion, our own economy appearing to have broken through the 2% GDP growth ceiling, and earnings improving, the stage certainly seems set for small-cap to excel. Add the effects of a tax cut and some deregulation, and the small-cap scenario looks even more promising. We are quoted near the end of the piece offering our own cautions about overall small-cap valuations along with our belief that the economy is doing even better than most investors seem to realize. From our point of view as small-cap specialists, what this otherwise interesting and informative piece misses is the logical conclusion—at least to our way of thinking. We do currently face a somewhat contradictory mix of historically high valuations, which means that multiples could remain level or contract, along with an accelerating global economy, which suggests that earnings are heading higher. Which of the two forces will win out? We see the answer lying in which part of the market you’re invested in. Both growth and defensive stocks within the small-cap Russell 2000 Index have outpaced their value and cyclical counterparts over the last few years, resulting in returns for small-cap growth stocks that are running well above their long-term rolling monthly averages. This, in our estimation, cannot be sustained. The combination of high valuations, ample leverage—much of it in floating-rate debt—and unprofitability is very likely to spell trouble for a sizable number of small-cap companies, as well as for investments in small-cap indexes, where the weight of these businesses is likely to impact returns for the asset class as a whole. Perhaps counterintuitively, this is good news in our view for disciplined and selective active managers. After all, effective active management is not about investing in an overall asset class—and certainly not in indexes. It’s about investing in businesses that we think are capable of having long-term success trading at prices that don’t fully reflect their favorable prospects. 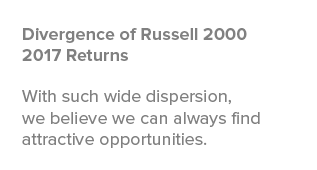 Every day, we put our experience and expertise to work in the effort to find these kinds of businesses across the large and diverse small-cap asset class that, it should be emphasized, contains thousands of companies outside the Russell 2000. We think investors need to be especially mindful of this breadth and diversity. 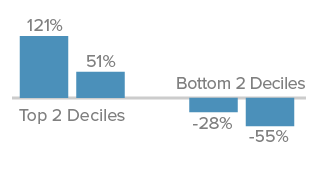 For example, the top two deciles of the Russell 2000 were up 121% and 51% in 2017, while the bottom two fell 55% and 28%. Given such wide dispersion, we believe that we can always find long-term opportunities. And as we look at what we hold in our portfolios today, we see plenty in economically sensitive industries that blend the attributes of profitability, relatively attractive valuations, and global exposure (both direct and indirect). These are the kinds of companies that appear best-positioned to benefit from burgeoning economic strength across the globe. Remember—the opportunity in small-caps is not with the index, it’s with select companies in the entire asset class.